you can do that both in your SAMSON Element and in the description of your SAMSON Element on SAMSON-Connect. 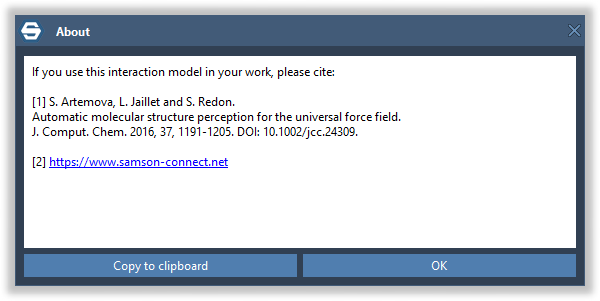 Note: Citation in a SAMSON Element can be visible to users only if the SAMSON Element has some GUI. "If you use this interaction model in your work, please cite:<br/>"
" S. Artemova, L. Jaillet and S. Redon.<br/>"
" Automatic molecular structure perception for the universal force field.<br/>"
" J. Comput. Chem. 2016, 37, 1191-1205. DOI: 10.1002/jcc.24309.<br/>"
Note that you may use the HTML subset supported by Qt, in particular to add links. First you need to upload your SAMSON Element on SAMSON Connect. Please, refer to the tutorial on Publishing a SAMSON Element. SAMSON Connect provides you the possibility to add links, images in the description of your SAMSON Element thanks to support of the powerful and easy-to-use Markdown markup language (SAMSON Connect uses CommonMark specification of Markdown). Learn more about how to use Markdown.